The Musings has rather obviously been slowing down over recent months. This is in small part owing to my current circumstances, but for quite some time I’ve felt that I was slowly coming to the end of what I could do with the blog in terms of how it has run to date. The Musings has been going for just a shade under 5 years now and for the last 3 of that, (fieldwork aside) I’ve averaged right around a post every day. Now sure they vary from a few lines to a few thousand words, but still that has been a pretty significant and consistent output and one that I’m proud of. However, it’s also getting harder and harder to write. When I started I always intended for this to be purely scientific in nature and stick to the archosaurs, science communication and related issues. More specifically though, I didn’t want to cover real basic stuff for non-experts or just cover new papers as there were lots of sites that already did that. But nor did I want to get into the super-detail and referenced reviews of some colleagues, it just didn’t appeal and I felt was often better covered by the papers themselves. Instead I stuck to a middle ground (or tried to) of beyond basic knowledge but not get right into the details – my rule of thumb has always been that it was for an audience who knew what a femur was, but not a 4th trochanter. Anyway, I really am running short of topics that I can write about quickly and easily that I’ve not covered before. I don’t want to have to start researching areas I’m not familiar with just to blog about them, but I also seem to have exhausted much of what I can say about dinosaurs and pterosaurs that’s not very basic or very complex. As you might guess therefore, I’m building up to the idea that the Musings is going to be slowing down still further after this post. I am absolutely not stopping it – there’s too much that it’s still useful for – guest posts, art interviews, museum and zoo reviews, coverage of my own papers, bringing links forwards and the like that are best suited to this platform and audience and not others. So while I do expect that from now there’s not likely to be much more than one or two posts a week on here, this is far from the end. Indeed, I mention other audiences since as the Musings slows, I’m starting afresh as a science blogger over on The Guardian. Back in January the call went out for new bloggers for their site, I pitched, and was offered one of the new places. This is in some ways little different to moving the site from one platform to another, and there enough bloggers who have moved to pastures new. However, I should warn regular Musings readers that I am intending to use this new platform to reach a new and broader audience. While I’ll only be on the electronic side of The Guardian, it is a UK national daily newspaper and as such it going to have a much more eclectic audience and with far fewer dedicated dinosaur enthusiasts. But given that I was already looking to take a new angle with my online writing, this is an excellent fit. I can continue to be productive and not have to repeat myself, but start on a simpler footing and broaden my coverage (I might even include, shock, mammals). So while my output on here is going to be slowing further, if you want to keep reading lots of Dave-generate palaeo thoughts, then head over to The Guardian, but rest assured that the Musings is not shutting down, merely dozing a bit more often. It’s been a good while since we’ve had a new art interview, but I’m pleased to report that Wayne Barlowe has kindly pitched in. While Wanye has not been especially productive in this line of art, he has made some major contributions and his work has turned up in plenty of dinosaur books over the years. As per usual all images are on loan here and should not be reproduced without his permission etc. I’ve been working professionally since 1977. Spent two years at Cooper Union and began to get called to do science fiction illustration for magazines and paperbacks. In the mid ’90’s I embarked upon a pleasant, albeit short-lived sojourn into the world of paleo art. Well, the truth is, I haven’t actually done any paleo art in some time. When I was doing nothing but, I probably spent a total of 4 – 5 years immersed in that world. During that time, along with doing a few paintings for myself, I rendered the color paintings for THE HORNED DINOSAURS and AN ALPHABET OF DINOSAURS both authored by Dr. Peter Dodson – somewhere in the neighborhood of forty or so paintings. 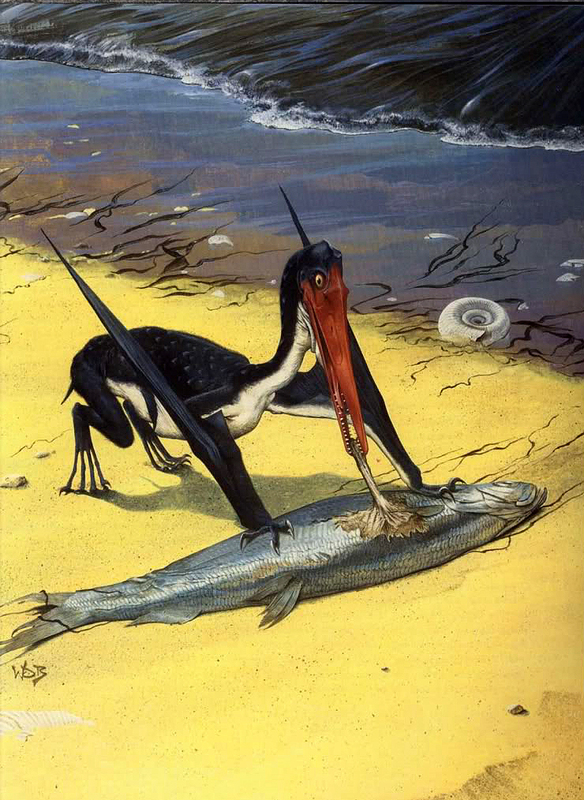 I had a deep and abiding interest in paleo art and paleontology, in general, since I was a child. My parents, both nature artists, had the full set of Augusta/Burian volumes and those acted as perfect catalysts for my young imagination. They actually served as something of an inspiration for my SF nature book, EXPEDITION. I am generally hyper-critical of my own work. With that said, a few of the paleo pieces still work for me. I’d probably point to JURASSIC SIESTA – a pair of satiated ceratosaurs – as my favorite. While I happily admire many of the pieces I see being produced today, I’d have to say that Zdenek Burian’s approach has never really been beaten. He was a painter first and a paleo man second. For me, his dinosaur and early mammal paintings are Art. The brushwork, the atmosphere, the composition all bespeak an Old World tradition and sensibility. There is much to learn and admire in those works, despite the advances in understanding of the Mesozoic world. For nostalgia reasons, his classic T-rex and hadrosaur painting has to be my favorite. I’ll always have a soft spot for ceratosaurs. So baroque and interesting. Given my short tenure in the paleo art world, the list is way too long. Apart from some the newly found feathered dinosaurs, I love flying reptiles – the whole idea is really too fantastic – and would eventually like to do a serious painting of one of them. I’m a big WW1 airplane buff, so these two interests might dovetail and find some expression in a pterosaur painting. Integrity. Integrity towards the composition, towards the world being depicted, towards the spirit of the creature being shown. So as I mentioned a few days back, on Saturday I hosted / presented a full-day event at a London Cinema on dinosaurs in the movies. The idea was to try and combine some history of dinosaur research with their various appearances on film and the changing techniques used to bring them alive. As such we touched on Owen and Mantell, The Lost World and One Million Years BC, stop-motion and rubber suits and everything from the Dinosaur Heresies to Reptilicus. All of this was bracketed by showings o the 1933 King Kong and Jurassic Park on the big screen. For me, it was exhausting. basically a 12 hour day and I was talking for more than half of that. I’m not doing that again in a hurry, or at least I need to space it out better, but it was certainly an experience and in terms of presentation I think I learned a fair bit. Chatting to various people I do think the pitch was about right for the audience and they seemed to keep up with what I was saying and absorb things. They seemed engaged and I got some good questions (though not too many). King Kong really hasn’t dated too badly at all. The introduction was much longer than I remembered (and Peter Jackson drew it out still further), with things only really kicking in and getting exciting in the second half with rather too much lead in time. There was also very little chemistry between the leads, or for that matter, Anne Darrow and Kong – something that the Jackson version did improve on massively. The effects were great though – there were some nice details I’d missed before and the way the layers were put together was excellent. Only a couple of moments really jarred which given that this is some 80 years old is very impressive. On the other hand, Jurassic park does seem to have dated rather badly. Sure I loved it when I first saw it, and have fond memories of it. While for a long time, I’ve thought of it as being actually quite a poor film with some great moments and great effects, I have to say that some of the CGI looks really ropey in hindsight. Sure this it also getting on and it was brand new technology when created, but I did watch JP just a couple of years ago on the TV and it looked fine – in full cinema size, less so. The T. rex attack especially, there are parts where the whole animal seems glossy and with a sheen, that’s only apparent when it’s computer generated, and it looks much more natural and ‘dusty’. In short, I’d probably rather watch KK again tomorrow than JP. 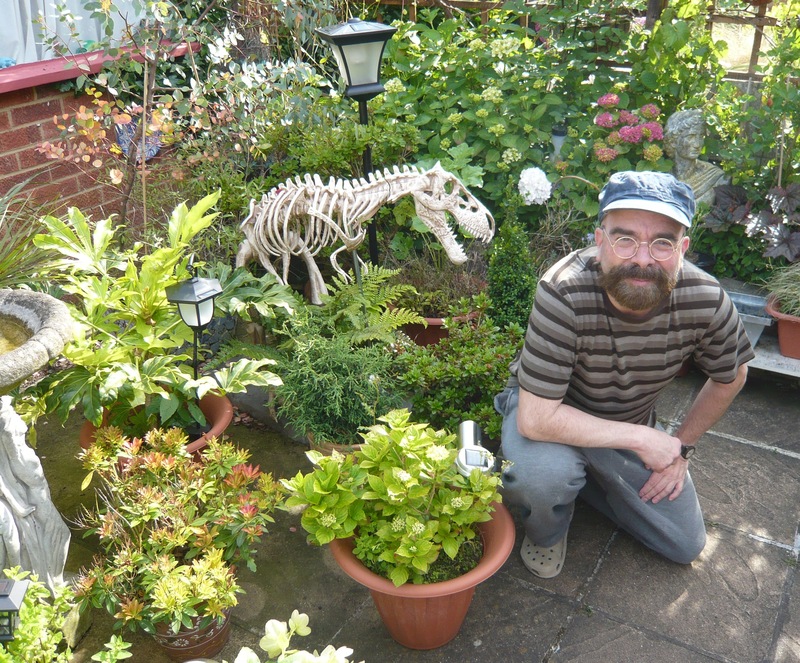 Oh yes, and I got to meet Himmapaanensis too, who brought along a lovely card of a hadrosaur he gave to me which was lovely. Overall it was fun, but also tiring and stressful. I hope people enjoyed it and learned something, that’s about as much as you can wish really. I spent yesterday with Luis Rey, catching up after far too long and helping him out as he wanted to start a blog. We had some computer problems, but eventually got things working and stuck up a bunch of posts. Luis has produced or modified a lot of pictures over the last couple of years that no-one has seen but now they’re starting to come online. If you want to check it, out, drop into his blog here. The last time I visited, Luis let me take a bunch of photos of his studio and that led to the first of the palaeoart interview series. It’s packed with casts, models, sculptures and paintings and includes a good number of commercial pieces that Luis has retouched or repainted. Once again he was kind enough to let me snap away so enjoy some more of his bits and pieces. A while back I put up a post about dinosaurs in film and got some great responses on films I’d missed or not seen. I didn’t say at the time as things weren’t certain then, but this was for a project I’m doing with a London cinema chain to talk dinosaurs, films and the like for a day. In fact, it’s this Saturday. Anyway, I suppose I should advertise the thing now we’re this close, so here’s the link to the event. I appreciate that few readers are in London and at least some bits of the talks might be pitched a bit low, but well, there will be dinosaurs, films, King Kong on the big screen, and lots and lots of me. And yes, I fully appreciate that the last part of that is unlikely to be the biggest draw / will be the most off-putting, but at least there will be dinosaurs. So, if you’re interested or know people who are, do sign up. 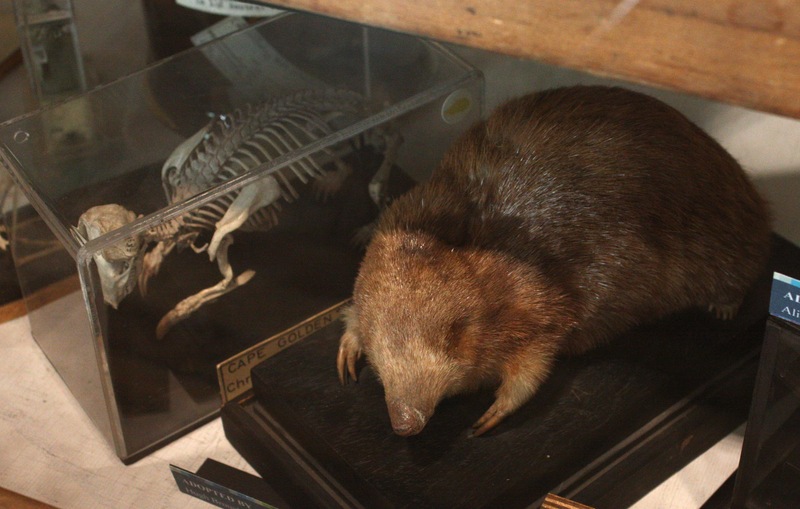 For the last couple of months I’ve been doing some on-and-off work in the Grant Museum of Zoology in London. I had dropped into this place a few times before in the past, but recently the collection has moved (all of about 100 yards down the road) to a new and more spacious setting. 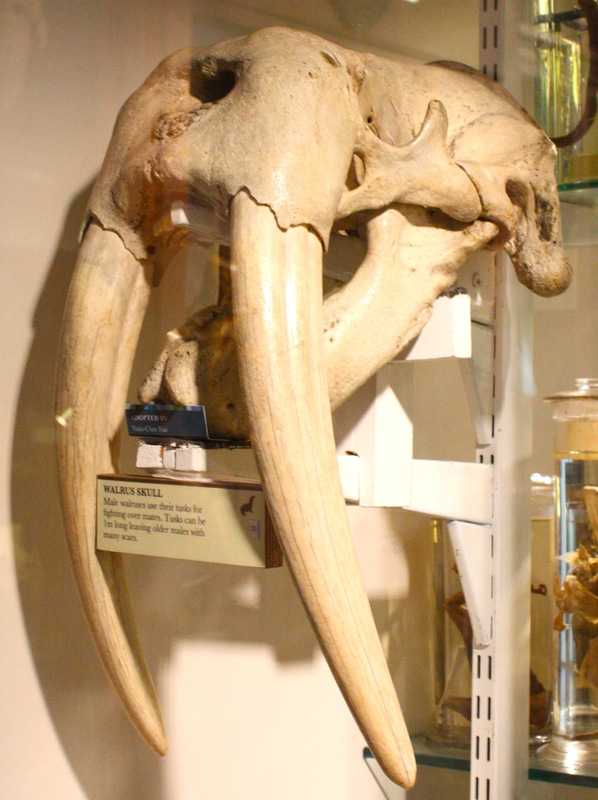 The museum was started, and remains, a teaching collection for comparative anatomy and as such is devoted to zoology alone and retains a great many and varied specimens on display. 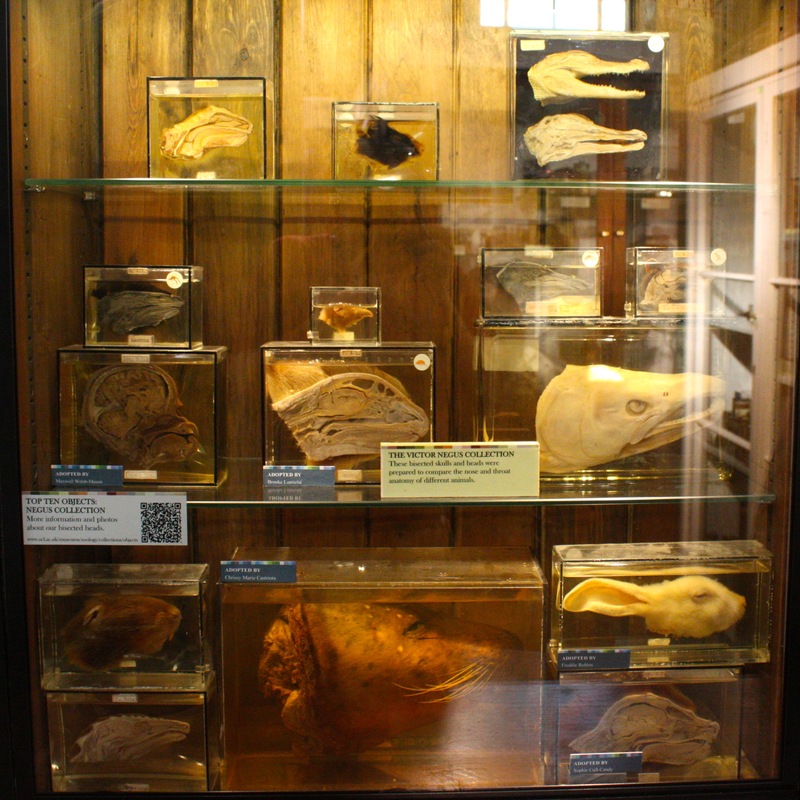 As with the traditions of older museums (like Oxford and Dublin for example), material is everywhere and there’s a lovely cluttered feel with every cabinet and shelf full of specimens. While it can be a nightmare to photograph in situ, each specimen can be see quite clearly so as a visitor it’s fine. 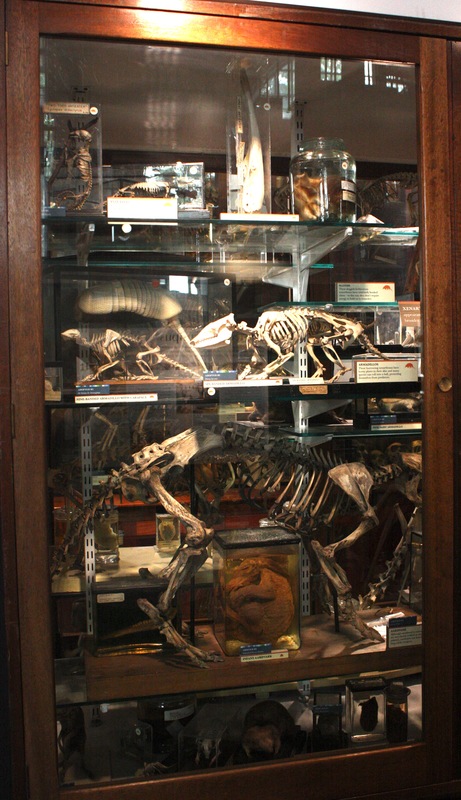 A lot of the material is grouped taxonomically providing great opportunities for comparing details (and there are some fossils in there too), though there are small asides for relevant collections such as a case devoted to dissected heads, or one comparing different ways of preserving zoology specimens, or recently extinct taxa (featuring a quagga and thylacine skeleton, and a skin of the latter). The vertebrates do especially well and there’s a super skeletal collection of the mammals in particular. 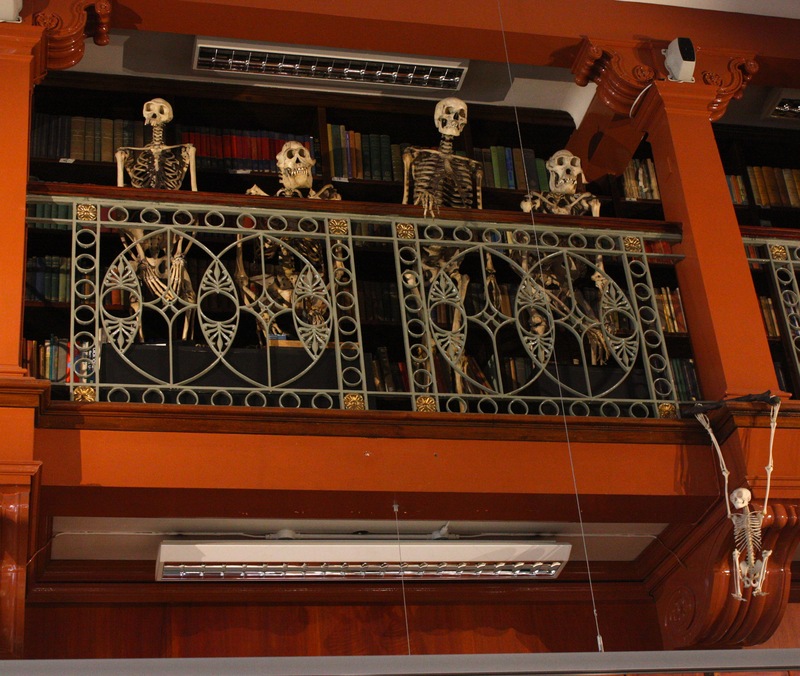 There’s a nice line in having skeletons next to taxidermy or pickled specimens too which is great, and all manner of odd and unusual pieces that are rarely seen on displays. 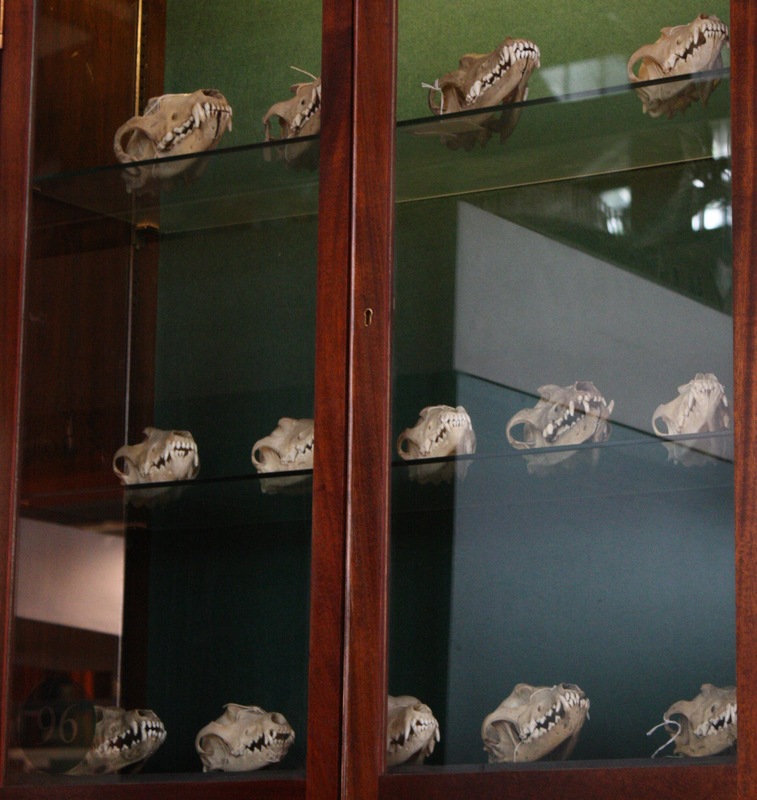 If you want to see a leopard seal skull, pickled baby aardvark or stuffed golden mole, this is the place for you. 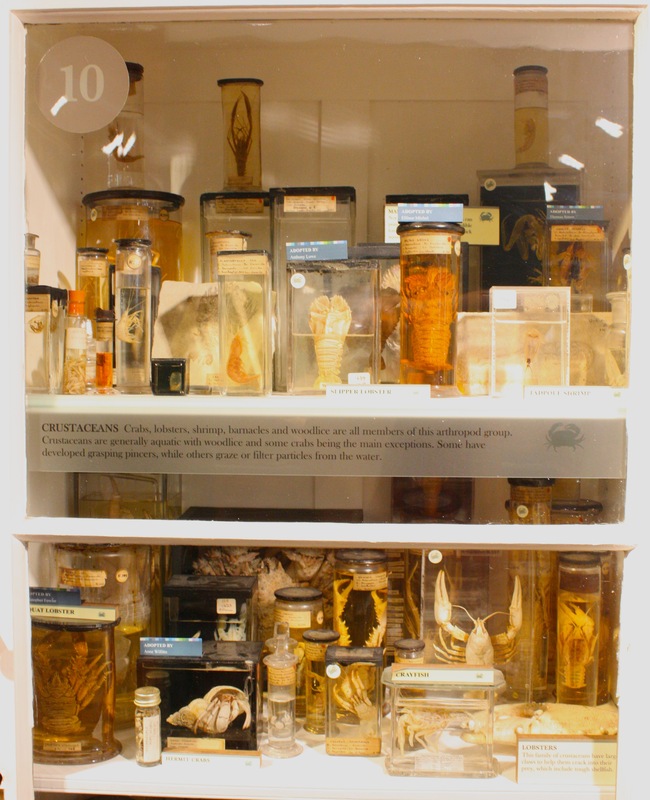 All in all this is a superb little museum and for those like me who do like their anatomy and simply want to see lots and lots of specimens, this really is a must. I’m interested in sauropod dinosaurs, the fossil reptiles of the Indian Subcontinent, and ichnofossils. I was never interested in dinosaurs (or fossils, for that matter) as a child. I’m still not crazy about them. I loved anatomy from an early age, which manifested itself in unsupervised frog dissections and me following around my uncle, a surgeon, in hopes of getting into the operating room (which I did). This interest in anatomy led me to believe I should be a doctor, and so I took the MCAT and worked for a year as a surgical technician – only to find that I didn’t like the clinical atmosphere or dealing with patients. I didn’t really know what to do with myself at that point. I ran into my advisor at Kalamazoo College, Paul Sotherland, who recommended Gould’s book ‘Wonderful Life’ to me. That book changed everything. It brought together anatomy, evolution, history, and adventure in a way that I hadn’t thought about before. I wondered who could be doing that sort of work nearby and eventually wrote Paul Sereno, who in 1992 was fresh from his second trip to Ischigualasto. I drove down to Chicago to visit him, and he showed me the skull of Herrerasaurus, which was mysterious to me. I don’t remember much about what Paul and I talked about, but after a couple of weeks he called to invite me to spend three months in the Sahara excavating a sauropod graveyard. I remember him telling me we were driving there from London. I said yes. I will take a ‘pass’ on this question, but I will say that the most fun I ever had working on a manuscript was when Matt Carrano and I put together the ‘response to reviewers’ for our 1999 paper on wide-gauge sauropod trackmakers. We were graduate students then, and we were reviewed by the formidable R. McNeill Alexander, Martin Lockley and Tony Thulborn. Thulborn alone had 80+ marginal annotations specifically about word choice and composition. He was so charming in the way he flayed the paper, one had to laugh. Example: we used the word “freer” in the original to refer to titanosaur vertebral articulations, to which he wrote something like (from memory, not a direct quote), “Gentlemen, there is no ‘freer’ ? one is either free or not, just like one cannot be ‘partially pregnant’ or ‘somewhat dead’.” Ha! There’s more to the story, but I’ll end here. I really admire some recent work on saurischian dinosaurs, but it is difficult to pick one discovery. Perhaps I’ll go with a technique. I was really blown away by Steve Gatesy’s recent SVP talk on 3-D motion analysis in birds. Sample sizes are typically quite low for sauropod dinosaur species, many of which are represented by a single exemplar. We have become habituated to describing all (or most) morphological variation in our exemplars as differentiating species or genera, often without entertaining the possibility of within-individual, within-population, and within-species variation. Discriminating among these sources of variation is to me one of the most important questions facing us. Philip Gingerich wrote this nice paper ‘George Gaylord Simpson: Empirical Theoretician’ in which he examined and categorized the nearly 13,000 pages of Simpson’s primary output. Although he was thought of as a ‘theoretician’, much of Simpson’s work, especially his early work, was empirical. I think that collecting careful, quality empirical data is important, and I would encourage students build their datasets with a question in mind. Bigger is not necessarily better; the dataset should be small enough that it can be managed and mastered. A student wanted to take on a project on dinosaurs, and since I was working on a lot of Paleozoic amniotes from South Africa, I came across the very interesting project of the Early Jurassic prosauropod Massospondylus. I brought home material pertaining to this dinosaur, and became interested in the group. Working on the early theropod Coelophysis. This is a very exciting project because the quality of the materials makes it the best preserved early dinosaur. Although prejudiced because it is my research, but the discovery of the Early Jurassic embryonic prosauropod dinosaurs, and of the nesting site where they have been found is one of the most exciting and important discoveries of the last decade. Gigantism. How could the sauropods get so large? I think the answer lies in the embryonic data and the growth rates of these fascinating organisms. There is a tendency now to do quick and dirty projects for maximum impact. In my opinion, careful descriptive work, careful illustrations and reconstructions, all lead to strong phylogenetic analyses, and good paleobiological interpretations. First hand study and illustration of fossil specimens is fundamental to our field, and if we do not do it, we lose our advantage as historical biologists. Much too often paleontologists do what I call pull the drawer out and code the specimen for analysis. This is not good science. Careful study, which includes preparation and illustrations of our unique treasures, the fossils, is fundamental to our field. The Musings has indeed been unusually quiet of late and my normal daily post rate has fallen away considerably. This is due to a number of factors, though I’d have to admit that the main one is simply not having much to write about. 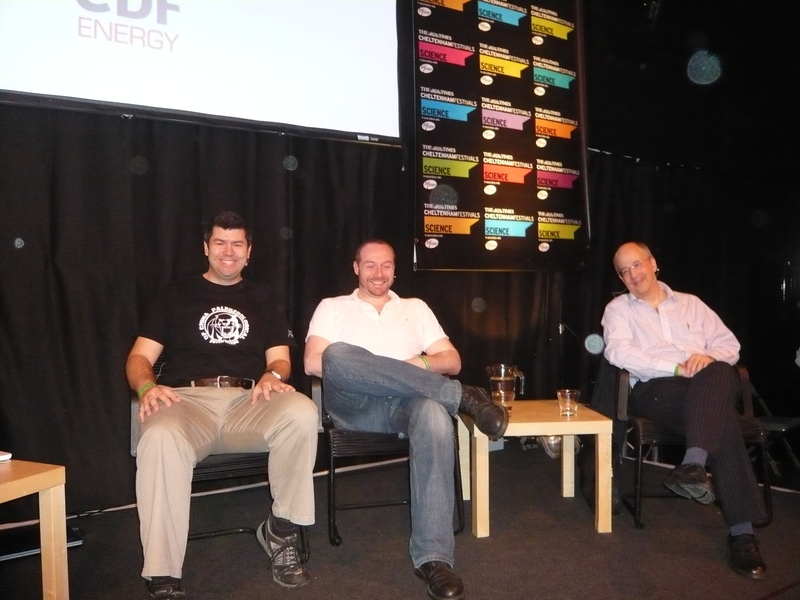 A contributory factor has certainly been that I’ve also been penning a couple of pieces for the Guardian website (here and here) and the fact that I had to prepare for, and then go to, the Cheltenham Science Festival. Those outside the UK might well not have heard of this, but as things go it’s a fairly prestigious event and I was delighted that my application to do some kind of event through Ask A Biologist. So this morning, four AABers assembled in Cheltenham. 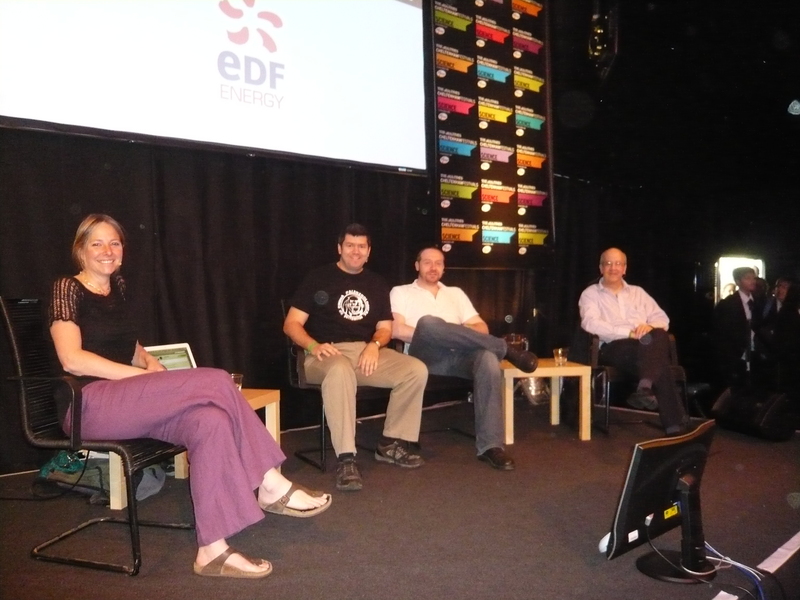 Here was me, Paolo Viscardi (of Zygoma), Alice Roberts (you know, her off the telly) and David Wynick (or, err, AAB really). In front of a panel of about 150 kids we attempted to tackle everything that they could throw at us. Overall, this worked really well and I was delighted with the result. We all managed to get a good bit of ‘air time’, each had questions that spoke directly to our specialities, and we managed to get through quite a few questions, but gave each the time it needed to provide some long and occasionally complex answers. Speaking personally, despite the large number of dinosaur talks and Q&As I’ve done recently I still managed to get two questions I hadn’t had before which at least made for some novelty. One aspect of it at least was simultaneously great and terrible. It was terrible that there were a couple of rather leading / insinuating questions that basically started from the premise that evolution wasn’t true. However, it was great that they were prepared to ask a team of biologists this and that we could speak to them about this and correct their misunderstandings and try to present the evidence. So all in all we had the chance to reach a wide audience and hopefully both answer some nagging questions, provide a little inspiration and show them a bit of the scientific method as well as the breadth of biology as a field and the people who work in it. We’ve already had some very positive feedback, so I’m comfortable we did a good job. It is nice to get out and do something beyond the web and reach out a little further and this was a fun event. I hope it’s the first of many. It’s been a bit quiet on here this week for a variety of reasons. In the interest of at least bringing you some token palaeontology, here’s a few links form the last week which are worth catching up with. First off, Heinrich brings up the annoying, but annoyingly common, problem of not being cited when it’s hard to see how you’ve been overlooked. Second, Matt Bonnan has renewed his blogging commitments and started anew. He begins with this nice three-part post with the forthright (but utterly appropriate) title of “Let’s face it, birds are dinosaurs”. Catch parts 1, 2 and 3 here. Finally, a piece of mine but in another venue. So at least I’m kinda linking to my own work. 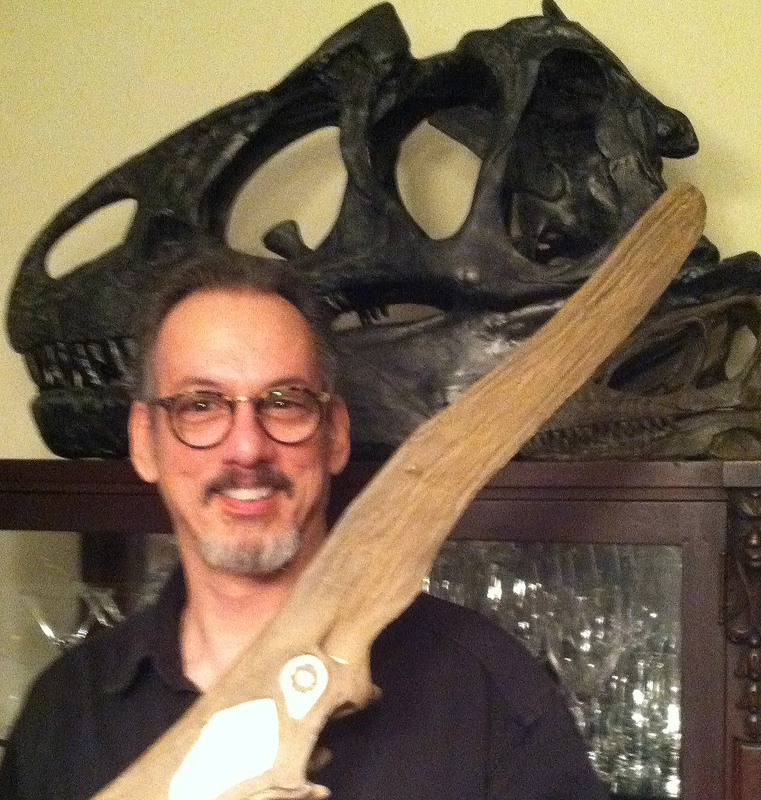 Lot’s of people have been able to stick their oar in over the Tarbosaurus sale, and now it’s my turn. This was my first piece for such a high-profile site and I’ve been pleased with the generally positive response. More on that issue to come shortly. 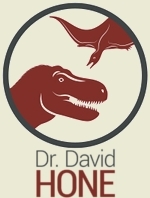 Dinosaurs and paleontology have been a lifelong interest, beginning about age 4. It’s fair to say that I was geek from Day 1, with “paleontology” being one of the first words I learned how to spell. I blame it all on my mother, who initiated and encouraged this dino-obsession. I was fortunate enough to find the first skull of Majungasaurus, a mid-sized theropod dinosaur known only from the island of Madagascar. This discovery demonstrated that a “domed” theropod — rather than a pachycephalosaur, as previously thought — lived on Madagascar. And Majungasaurus has been pivotal in range of subsequent studies, from details of dinosaur head anatomy to the break-up of the supercontinent Gondwana. For me, the most interesting discovery is the presence of dinosaur “provinces” on the isolated landmass of Laramidia (western North America) during the Late Cretaceous (Campanian). The occurrence of distinct communities of coeval dinosaurs on a diminutive landmass suggests that the ecology and evolution of large-bodied dinosaurs may have differed in fundamental ways from that of more recent big-bodied mammals. How were dinosaurs able to fit so many giant species on such a small piece of real estate? The answer may point to differences in dinosaur physiology and/or ecological dynamics in a hothouse world. Either way, profound discoveries are likely to emanate from this discovery. Of course there are many big questions that remain unanswered. For example, no one can yet state with confidence how dinosaurs were able to achieve sizes that were often well in excess of land animals before or since. In short, we’ve only just begun to understand the world of dinosaurs. To my mind, however, the biggest, most pressing question is this: How do ecology and evolution function in a hothouse world? Thanks to the recent acceleration in human greenhouse gas emissions, we’re heading toward a much warmer global climate, with global effects that will impact the entire biosphere, including us. Yet our firsthand experience as a species is restricted to icehouse climates. By examining Mesozoic and early Cenozoic hothouse worlds, together with their constituent floras and faunas, we will undoubtedly make major insights that will inform our future. 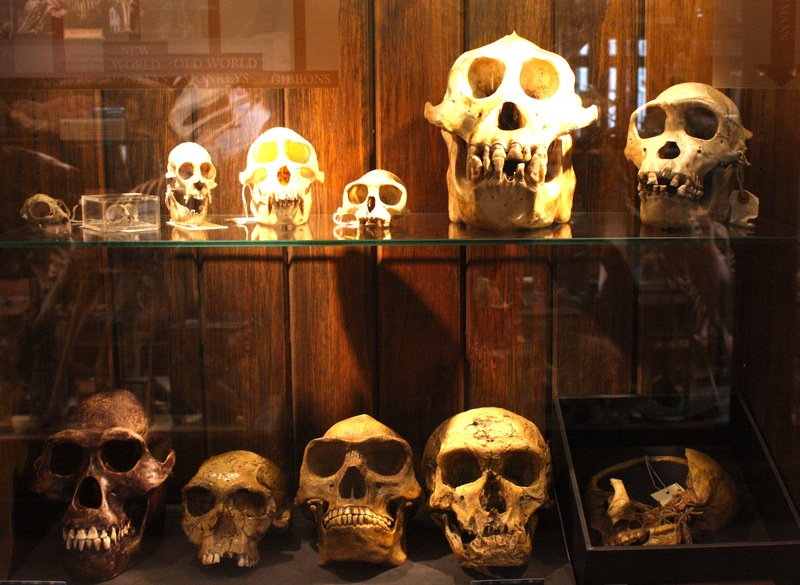 The best advice I can give students of paleontology can be summed in a single word: diversity. Learn as much as you can about as many different paleo-related fields as possible: the list includes stratigraphy, sedimentology, anatomy, phylogeny, ecology, evolution, climate, and isotopic studies. Also learn early how to collaborate with researchers in other specialties (not as intuitive as you might think). Whatever you end up doing, you will benefit from the ability to juggle and intermingle big ideas, and to work with others in testing those ideas. A diverse skillset will also put you in a stronger position to get a job, and to make major contributions to the field. A couple of things intersected over the last week or so that have had me thinking a bit more about evolution and how it’s presented. More specifically, I’ve increasingly noticed a phenomenon that seems to get little attention and might be worth a bit more consideration. In short, there do seem to be a good number of people who, for whatever reason, are really quite happy with the concept of evolution as a whole (species arise, natural selection happens, common ancestry etc.) but seem to profoundly misunderstand how and why it works. It’s perhaps understandable that a lot of focus goes into winning over the people who don’t accept that evolution even exists, but we should not ignore those who are happy enough with the idea, but actually don’t understand it at all well. After all, they might well be vulnerable to misinformation or further misunderstandings, when in fact they should be the kind of people who would be resistant to such things. I’ve heard or come across all sorts of basic mistakes and misunderstandings like the idea that evolution is directed (or has some predetermined outcome), that mankind is all but inevitable, that evolution occurs at the individual level, that X is the exact and direct ancestor of Y and so on. All of these things are the kinds of fallacies that creationists use to undermine evolution or promote confusion about how it really operates, yet these are also errors made by those who have no problem with the concept. While these mistakes are not ignored when it comes to public outreach in science, I do wonder if in part, we are paying too little attention to a sizable number of people who would benefit from knowing more and having a better understanding and appreciation of evolution, and likely be interested in learning more. We’re not talking about deep and complex evolutionary theory, merely some fairly basic concepts that should be easy and simple enough to explain quickly and effectively, the question is, are we doing that for the people who need it?